Having kids is a big financial responsibility, so anytime you can find fun things to do with children for FREE, it’s a big help! 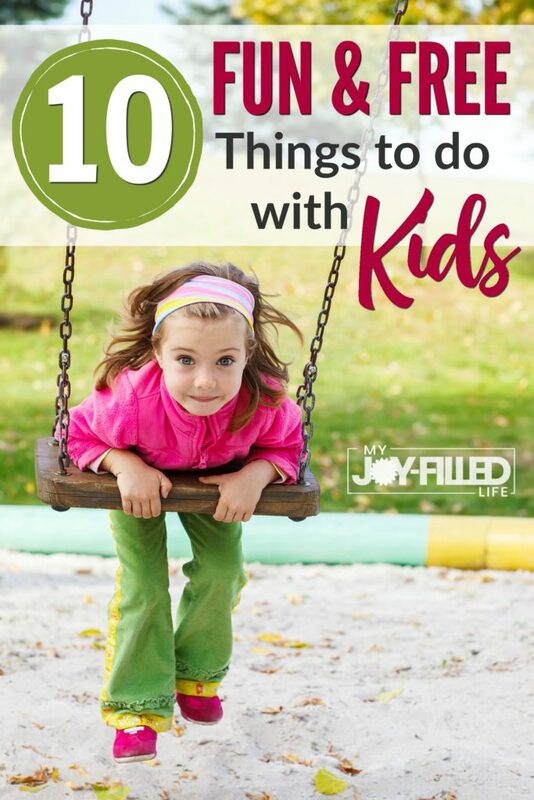 This is a great list of ideas that are available in a variety of locations that you can do with your kids pretty much any time of the year. If anything, hopefully this list will inspire you to find additional free activities in your area. And if you do, I’d love to hear about it. Now before you roll your eyes, consider this – libraries everywhere are transitioning from fuddy-duddy academia to bustling community centers. Yes, you still need to keep your voice down and be respectful, but libraries have more to offer than just books. Many libraries have free children’s programs throughout the year, not just during the summer. Lots of libraries have computers designed specifically for children with educational games. Additionally, some states give their public library free passes to museums throughout the state that can be checked out by patrons at no cost and are good for admission for up to six people. Again, this is obvious, but underrated. Many cities have splash pad parks in the summer and during the cooler months you can take your little ones to regular old swing and slide parks. Make a game of it by visiting every park in your area and taking a photograph at each one. Step up the challenge by taking along a favorite toy and photographing it doing different activities like sliding, climbing, digging, etc. Do an internet search to find a botanical garden near you. Take your kids on an adventure to see all sorts of native plants. Most botanical gardens have cool structures, ponds, and streams that interest children. Sometimes botanical gardens will sponsor children’s programs with a small suggested donation, but it’s free to wander around and look at the scenery. You don’t even have to wait for snow! In the winter you obviously know how to play on a sledding hill, but during the summer try collecting long pieces of cardboard (think appliance boxes), duct taping them together and sliding down on pool floaties. If you don’t have a good hill on your own property, just make sure you get permission before you use another hill, or find one at a nearby park. In the summer it’s easy to find free movie showings of older films in parks or at libraries. If you want to do this in the fall or spring, you can do it at your own home using a projector and the side of your house or by hauling your TV and DVD player out into the yard for a fun neighborhood movie night. Cuddle up with blankets and pillows, and don’t forget the popcorn. Find a local farmer and schedule a visit to see the animals. Some farms will let you wander around for free but some charge a small entrance fee. If you have friends that have a hobby farm, ask if you can take your kids over to pet the goats or help pick vegetables from the garden. Another great option to see some animals for free is to visit your local humane society. This is free if you already have inner tubes, otherwise it could cost you a few dollars. Gather up any inner tubes you have and scope out a slow moving section of a river near year. Coordinate placing a vehicle at the ‘getting out’ spot and then drive up to the ‘getting in’ spot with your crew and Voila! – a free lazy river. Make sure you research the river to make sure it’s safe and be sure to wear your life jacket. If you don’t have a river near you, perhaps there is a lake nearby where you could lounge in your tubes or just swim. Your local ranger station or state park will have good information about nearby hiking trails that are good for children. A quick internet search will most likely provide you possible hiking trails as well. Make it interactive by creating a simple scavenger hunt list before setting out and don’t forget to take water and wear comfortable shoes. State and federal agencies have fish hatcheries in many areas. Again, use your favorite internet search engine to find out more. Fish hatcheries are usually open to the public and have self-guided tours. You’ll get to feed large display fish and see how hatcheries raise fish to aid in conservation. Geocaching is like a real-life treasure hunt that uses GPS coordinates and clues to help you find the hidden geocache. There are literally thousands of geocaches all over the world, so you can do this anywhere you go. You probably have some in right in your own hometown. Check out the Geocaching website for more information on this fun, family activity. What are some fun and free things you like to do with your kids? I’d love to add some more ideas to my list.